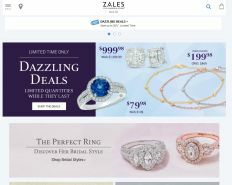 As a popular jewelry retailer, Zales grew from a single store selling jewelry, appliances and cameras to a major international jewelry corporation to become one of the largest fine jewelers in retail shopping malls across North America. Get up to 30% Off select Online Exclusives. Get free shipping to your door or to your store! Get 75% Off The Heart Within Regular Prices Jewelry. Get up to 75% Off Select Expressionist styles. Get Couples Bold Script Name and Heart Outline Necklace in Silver For $24.99, original $99. Online Only. Take $50 off your next purchase when you sign up for emails. Valid for New registrations only. Get 15% Off Design Your Own Jewelry Collection. June’s Birthstone! Get up to 20% off select pearl. Get $30 off $100, $125 off $400, $250 off $750, $500 off $1500, $1000 off $4000 Orders. Online Only! Get $50 Off $150; $100 Off $300; $200 Off $600; $350 Off $1000. Get up to 40% off Select Endless Brilliance collection. Get free shipping on your order with no minimum reserve! Get 10% Off select diamond and gemstone jewelry. Get Script Name Necklace in Sterling Silver with 14K Gold Plate for $24.99, original $99. Online Only. Get up to 40% Off Select Anniversary Gifts. February’s Birthstone! Get 20% Off Select Amethyst styles.